Policies – Everything you want to know about policies. One policy I think we are all familiarwith is that we use only Conference Approved Literature (CAL). but we also have policies on Alateen, Anonymity, Public Outreach, Etc. Handbook – This is mostly Al-Anon structure. Interesting. Charter – This is only five pages. 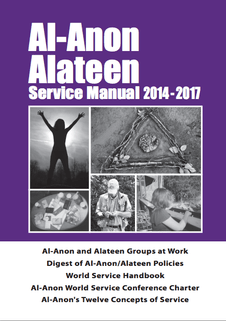 Did you know that it says no changes can be made to the Steps, Traditions, and Concepts without written consent of three-quarters of all Al-Anon groups in the U.S. and Canada? A pretty tough hurdle for change. Concepts – These are our Third Legacy. (Know what the first two are?) The Concepts were developed by a committee chaired by Lois W. and first discussed at the 1969 World Service Conference. They were formally adopted in 1970. The Concepts of Service record the “why” of our service structure.